Expert Wood Finishing on site or in our shop. Whether you have kitchen cabinets, stained woodwork or built-ins with clear or painted finishes, Western Accents is the right choice for your wood finishing project. We can finish almost any wood project, from ornate bars in restaurants to kitchens to exposed beams in commercial office buildings. Wood finishing is a very delicate process. Very few companies offer the in-depth experience that we do. We know wood and which finish to use for your particular need. Soft woods take finishes differently and require different finishing techniques than hard woods. Some woods require the application of a “grain tamer” before they can be stained in order to maintain a beautifully finished piece. We know the finishes. We know how they will perform over time for best color uniformity and clear, beautiful finishes. Specialized equipment. It takes specialized equipment to work with delicate or historic wood finishes. Knowing what can be done and the right equipment to use is essential. Easing the process. Many wood and metal coatings have very strong odors, and just really smell, whether they are considered “green” or not. We can recommend which finish would best suit your individual needs or desire. Unlike many painting companies we also have the ability to finish your wood projects in our own shop. Expedites job-site time. No “down time” waiting for “paint to dry”. Eliminates painting on-site so there is no sanding dust or odors in your environment. Provides better control over the finishing environment in regards to moisture and temperature. We work in virtually dust-free spray conditions which insure a smooth finish. Cost savings. 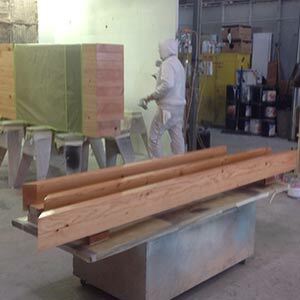 Once your project is in our wood finishing shop we can work on it as required allowing for drying intervals and re-sanding requirements, while saving time and man hours returning to your job site.